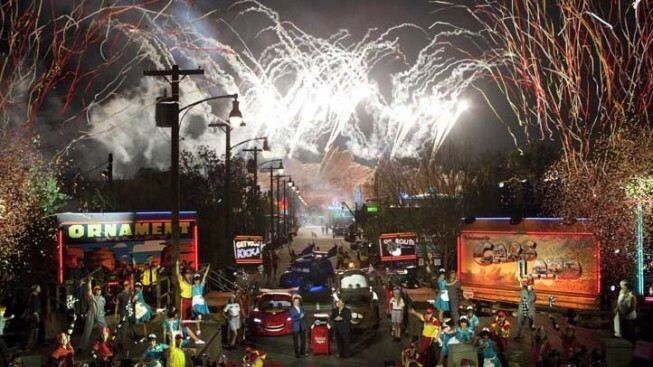 The cast and creative team from "Cars" celebrate the gala opening of Cars Land at Disney California Adventure park. When it came to racing headlong into the auto-populated world of “Cars,” Disneyland put the pedal to metal. Cars Land is the latest attraction at the Anaheim theme park’s neighboring sister property Disney’s California Adventure. 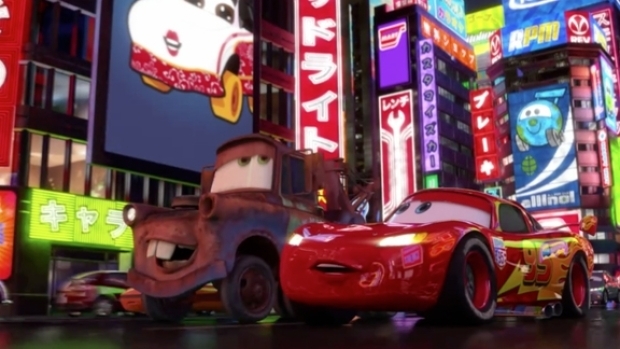 It was inspired by Pixar’s 2006 smash film, "Cars," and its 2011 sequel, and opens its roads June 15. The famed Imagineers have spared no detail in bringing an unbelievably vivid vision of Radiator Springs, Ornament Valley and the mid-20th Century world of Route 66’s Southwestern leg that inspired the film’s visual style to full – and very fun – life. Jaw-dropping in its attention to the tiniest immersive factor, Cars Land delivers a trio of rides – the thrilling, high-octane Radiator Springs Racers, which sends riders on a tour-turned-roller-coaster-road race through town; Mater’s Junkyard Jamboree, a tractor-pulled whip ride for the little ones; and Luigi’s Flying Tires, where guests slide on giants tires across a air-pressurized surface, reminiscent of Disneyland’s venerable Flying Saucers attraction of the ‘60s. Meanwhile, shops and eateries painstakingly recreate the car-themed locales from the films, including the Cozy Cone Motel, Flo’s V8 Café, Ramone’s House of Body Art and Sarge’s Surplus Hut. While trekking through Radiator Springs, PopcornBiz was joined by some of the key creative forces behind the movies, from Pixar and Disney, for a crash course in the creation of Cars Land. John Lasseter (director of “Cars” and “Cars 2,” Chief Creative Officer of Pixar and Walt Disney Animation Studios and Principal Creative Adviser for Walt Disney Imagineering): This has been a labor of love for five years working with Walt Disney Imagineering. Those Imagineers are so talented. We wanted to bring to this park, Disney California Adventure, the level of immersive theme-ing and storytelling that Walt Disney put into the first Disneyland. It was something no one had done before, and it's what we all love. When you walk through the tunnel under the train station into Main Street you're transported – the music, everything – and that's what we wanted to achieve here. John Ratzenberger (voice of Mack the Truck): Even the cafes and the restaurants and all that, when you look down at the street, they did the same attention to detail in this 12 acres that they did when they were rendering the film. They could have very easily not put certain kinds of trees. Even when you look at the fence posts – they're a little aged, the fences! They're not brand new. That's true artistry. That's da Vinci. Edie McClurg (voice of Minnie): It's amazing to me that you go into a room with John and a recording person and you do this thing in a little tiny space and then all of a sudden you're on a big screen, and then they take it one more big step to build this real desert place. I was agog, to tell you the truth, when I saw it. It was just something else. Robert Iger (Chief Executive Officer, The Walt Disney Company): It's unbelievably exciting. First of all, it speaks volumes about the fact that Pixar and Disney are one, to have the great animators from Pixar working side by side with the great Imagineers from Disney to create this. It's just staggering in terms of how big, how beautiful, how inventive, how close it is to what the movie actually was. To create that place and enable people to immerse themselves in it, to be completely transported to it and live within those stories, it's pretty remarkable. 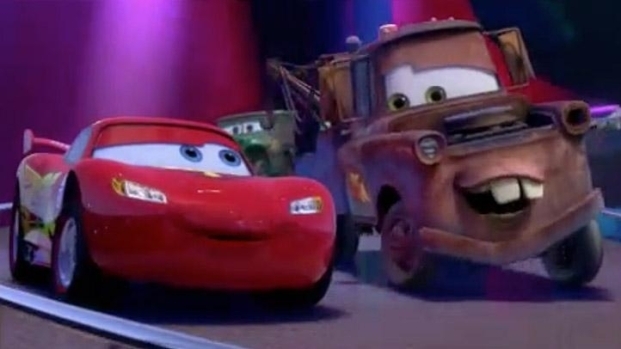 Lasseter: Immediately when we first started, I sent all the Imagineers on a long trip down Route 66 and they came back wide-eyed, saying, 'We know, we know – we get it now!' And they have sweated on every tiny detail. The rides are amazing. The restaurants – the food they serve is inspired from the road. Everything: the plants are themed right. Every bit of detail: the lighting, the music in the Land, and you are truly transported. When you're there, there's a great vibe. That's the best way I can describe it. You just don't want to leave. You do a ride and then you kind of just want to get something to eat, get something to drink and just hang out. And especially, you've got to see when the neon lights come on. It is so breathtaking you can't believe it. Michael Wallis (voice of Sheriff and noted Route 66 historian): When I worked on the film, taking the creative team out on the road, I could see their passion for it and I think they picked up on mine. And then taking the Imagineers out for this, that feeling was duplicated again. When John Lasseter walked me through the whole thing it was a great moment, because it's far better than I thought it was going to be – Far better! So many road warriors will be pouring in there. This is the place now for the hip people to go. This brings the cool factor. Lasseter: The first time I remember coming to the parks my mother bought the Disneyland tickets with S&H Green Stamps. She was a schoolteacher and my dad was a parts manager at a Chevrolet dealership, so she saved up the Green Stamps and bought the first set of tickets. Then we went on December 21st on my brother's birthday. And we went there and I'll never forget being a little kid and just falling in love with everything. And one of the rides I remember loving the most was the old flying saucer ride. It's the bumper cars where you float on compressed air in Tommorowland – I never forgot that! What's fun is we brought that type of ride back in Cars Land with Luigi's Flying Tires. Larry the Cable Guy (voice of Mater):My very first trip to Disneyland was ten days ago. I've never been to Disneyland. I wish I would have come out earlier, but I never got to make it. I lived in Florida most of my life, so we did the other one that I'm not supposed to mention, but never the original. The original's always awesome, so when I got to come out here it was pretty cool. Now people wouldn't know this about me but I went on the carousel today and got on the same horse that Julie Andrews rode in 'Mary Poppins.’ They said, 'That's the Julie Andrews’ horse.' I said, 'I'm getting on that horse, doggone it!’ There’s just a lot of history. Iger: Walt said Disneyland would never be completed, and he's right. It never will be. There are always things that we can do. Whether it's things that are bigger, better, more. But the most important thing is that we continue to give guests wonderful, memorable experiences – deliver them the kind of experiences that are magical in so many different ways. And that's what it's all about.